Guys like me write words. Tuesday May 2 marked the 100th anniversary of the birth of Lorenz Hart, one of this country's greatest and most cherished lyricists. The centennial is being honored throughout the year, and across the country, but nowhere were the tributes more Hart-felt than in his hometown of Manhattan and during his birthday week. Noting all of the above, New York City Mayor Rudolph Giuliani proclaimed the week of May 2 to May 9, 1995, "Lorenz Hart Week" in Manhattan (the Bronx and Staten Island, too). The work of Larry Hart sings for itself, and we listen to one of the most original lyricists of our time or any other. In 1919, Hart was attending the Columbia School of Journalism when a mutual friend introduced him to Richard Rodgers, a budding composer seven years his junior. Of their first meeting Rodgers later recalled: "I left Hart's house having acquired in one afternoon a career, a partner, a best friend, and a source of permanent irritation." The team made its professional debut their first year out when "Any Old Place With You" was put into the 1919 musical comedy A LONELY ROMEO, but then they had several wan years and almost quit the business. During this time Hart, who spoke fluent German (and was a descendant of the poet Heinrich Heine) supported himself by translating German operettas and plays for the brothers Shubert. Yet another gala provided Rodgers & Hart with their long-awaited breakthrough: The Theatre Guild's GARRICK GAITIES in 1925 featured a fresh and inventive score highlighted by the team's valentine to their hometown, "Manhattan." Overnight Rodgers & Hart were in demand and they were ready for it: from 1920 to 1930 they wrote an astonishing array of musical comedies for Broadway and London's West End. At the pinnacle they were turning out an average of four new shows a year, including DEAREST ENEMY, BETSY, PEGGY-ANN, THE GIRL FRIEND, CHEE-CHEE and A CONNECTICUT YANKEE. 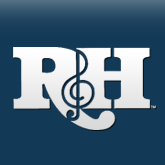 In 1930 Rodgers & Hart relocated to Hollywood, where they contributed songs and wrote the scores for several movie musicals, including the landmark LOVE ME TONIGHT starring Maurice Chevalier; THE PHANTOM PRESIDENT starring George M. Cohan; HALLELUJAH, I'M A BUM starring Al Jolson; and MISSISSIPPI starring Bing Crosby and W.C. Fields. Hart also provided the translation for a 1934 MGM version of Lehar's THE MERRY WIDOW, and in the same year, wrote with Rodgers their only "pop song" - "Blue Moon." Rodgers & Hart were lured back to New York by legendary Broadway producer Billy Rose in 1935 to write the songs for his circus musical spectacular, JUMBO. Their score featured "The Most Beautiful Girl In The World," "My Romance" and "Little Girl Blue." 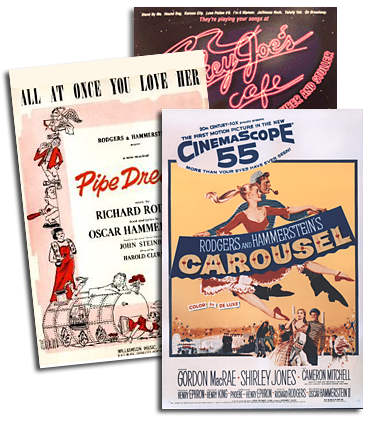 From 1936 to 1943 Rodgers & Hart wrote a series of Broadway musical comedies, each of which seemed to top the one before in terms of innovation and box office success. ON YOUR TOES, BABES IN ARMS, I'D RATHER BE RIGHT, I MARRIED AN ANGEL, THE BOYS FROM SYRACUSE, TOO MANY GIRLS, HIGHER AND HIGHER, PAL JOEY and BY JUPITER dazzled Broadway in spectacular succession. Songs from this "golden era" included "There's A Small Hotel," "I Wish I Were In Love Again," "My Funny Valentine," "Where Or When," "The Lady Is A Tramp," "Spring Is Here," "Falling In Love With Love," "Sing For Your Supper," "This Can't Be Love," "I Didn't Know What Time It Was," "It Never Entered My Mind," "Bewitched, Bothered And Bewildered," "I Could Write a Book," "Nobody's Heart," and "Wait Till You See Her." The Rodgers & Hart partnership disbanded temporarily early in 1943 when Rodgers collabor-ated with Oscar Hammerstein II on OKLAHOMA! and Hart started work on a musical, never finished, entitled MISS UNDERGROUND with music by Emmerich Kalman and a book by Paul Gallico. The partnership resumed in the autumn of '43 with a revision of A CONNECTICUT YANKEE, featuring six new songs including Hart's final lyric, ""To Keep My Love Alive."" The new production of A CONNECTICUT YANKEE opened on Broadway November 17, 1943. Already ill at the time, Hart developed pneumonia soon thereafter and died on November 22. There is a tenderness in some of Larry's lyrics that always catches me off guard and brings a tear to my eye. His wit was delicious and pithy. When the subject was love—the love he never knew—well, there is that tear... One very late night, he turned to me and said, "I've got a lot of talent, kid. If I cared, I probably could have been a genius." Whether he cared or not, he was as close to being one as lyric writing has produced.